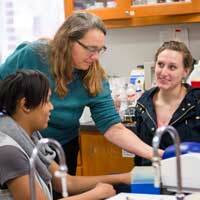 Professor Stephanie Schroeder works with students in a biology class. ST. LOUIS – Webster University was ranked first for “Faculty Resources” among all Midwest Regional Universities in the latest U.S. News & World Report rankings. Webster is the only Midwest Regional University in the St. Louis region to make the list and one of only four Midwest Regional Universities in Missouri to be ranked. The “Faculty Resources” ranking uses several metrics to quantify the institution’s commitment to instruction as measured through student/teacher ratio, compensation, percentage of faculty who are full-time, percentages of faculty with terminal degree, and class size. The ranking only looked at the University’s faculty in the St. Louis region. The University also was ranked in several other categories, including first for economic diversity, fifth for most classes with less than 20 students and 13th for faculty compensation. Class size: (40 percent of the score) Schools received the most credit in this index for their proportions of undergraduate classes with fewer than 20 students. Faculty compensation: (35 percent of the score) This includes full-time assistant, associate and full professors. The regional differences in cost of living were taken from indexes from Runzheimer International. Faculty with a doctoral or terminal degree: (15 percent of the score) This measured the percentage of full-time faculty members with a doctorate or the highest degree possible in their field or specialty during the 2015-2016 academic year. Proportion of full-time faculty: (5 percent of the score) The number of full-time-equivalent faculty members is equal to the number of full-time faculty members plus one-third of the number of part-time faculty members. Student-faculty ratio: (5 percent of the score) This is the ratio of full-time-equivalent students to full-time-equivalent faculty members during fall 2015. Out of the 163 institutions in the Midwest Regional Universities category, only three other Missouri institutions were ranked for Faculty Resources: Drury University (7th place), Truman State University (41sth place), and Rockhurst University (85th place). Economic diversity – 1st place. Highest proportion of classes with 20 or fewer students – 5th place. Faculty compensation – 13th place. Highest six-year graduation rate of Pell recipients – 19th place. Most international students – 24th place. For the U.S. News & World Report’s overall ranking methodology, visit: http://www.usnews.com/education/best-colleges/articles/ranking-criteria-and-weights.